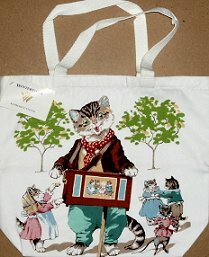 This new cat tote bag is printed with a vintage design called Tabby Town. The design is from an illustrated nursery rhyme book called "Pussycat Street". This canvas tote bag is 16 1/2" wide x 14" high x 4 1/2" deep. Sturdy enough for all your shopping needs.